Mmmmm–Wish you could taste this hot and hearty heirloom bean soup! It hits the spot on this chilly desert evening. Makes me want to share the message of its goodness. Piping hot and delicious Tom’s Mix heirloom bean soup warms the soul and enriches the body…. November is National Diabetes Awareness Month and diabetes is indeed now EVERYONE’s issue. WE ALL need to tune in to be aware of this increasing health problem, now of epidemic proportions especially here in the Southwest. The wonderful thing is that we CAN DO SOMETHING TO HELP by the very foods we serve each other–both for meals and snacks. Tia Marta here with healthy recipes that diabetics can enjoy for pot lucks and drop-ins over the holidays or any time. Interestingly, the great majority of our traditional Southwest foods have LOW GLYCEMIC INDICES. (The lower the glycemic index the better. Pure sugar has an index of 100. Foods lower than a GI of 55 are considered low-glycemic.) So many of the fabulous recipes recorded in this Savor-the-Southwest archive using traditional wild desert foods (e.g. mesquite and cholla buds) and SW Native crops of Baja Arizona are low glycemic foods great for HELPING TO BALANCE BLOOD SUGAR! Beans have Glycemic Indices from 30-49, high in complex carbs, soluble, and insoluble fiber, which slow the release of sugar into the bloodstream. Our rich tasting and versatile Tepary Beans are among the best! In a blender or food processor, add beans and garlic. Blend gradually with enough reserved liquid to make a frosting-like consistency. Add lemon, olive oil, salt (and optional tahini) to taste. Store in freezer, or in fridge in serving size containers to be ready for impromptu company. Serve with corn chips or whole grain crackers for a healthy low-glycemic snack. Flor de Mayo’s Traditional Native American Tepary Mix makes the ideal consumable holiday guest gift– available at NativeSeedsSEARCH store on North Campbell, Tucson; at Tohono Chul Park Museum Shop; Tucson Presidio Museum and at ArtHouse.Centro in Old Town Artisans, downtown Tucson; and the UNICEF Store at Monterrey Village, Tucson. 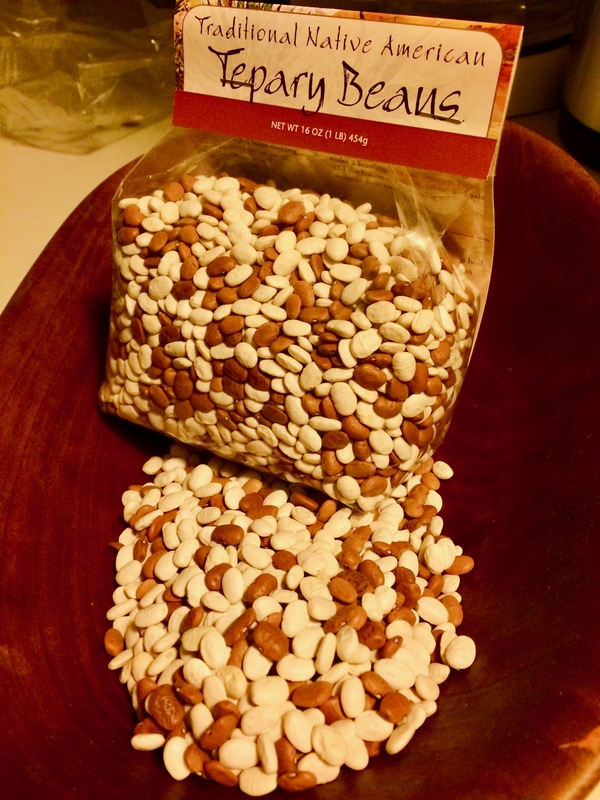 Assorted tepary beans can be ordered from Ramona Farms in Sacaton, AZ, or San Xavier Farm Coop. 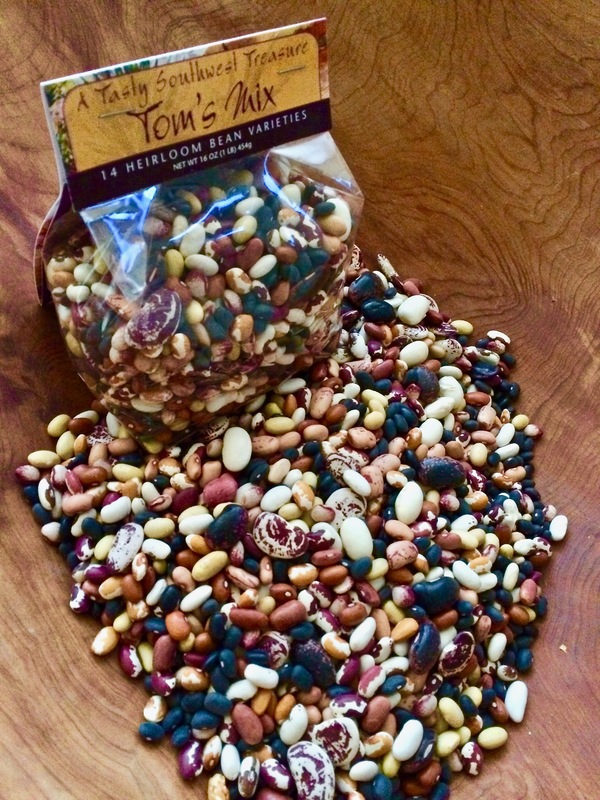 Tom’s Mix–the most delectable mix of 14 colorful heirloom beans from the Southwest! Tom’s Mix makes a rich, warming soup, delicious dip, or mixed bean salad. Yummy easy cooking instructions and recipes are on the label. 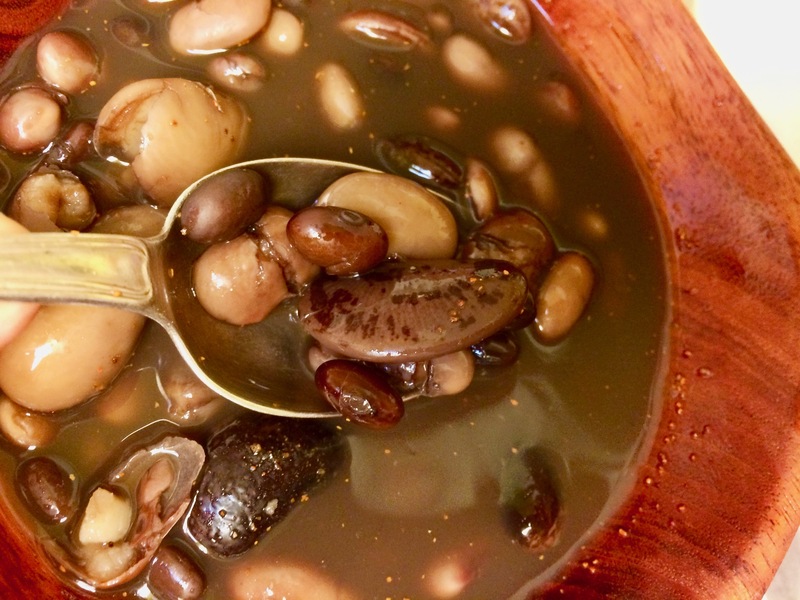 The taste-jewels in Flor de Mayo’s Tom’s Mix Southwest heirloom beans can be viewed in detail at Tia Marta’s earlier post Glorious Diversity–check it out and start salivating. You can find them at the above linked sources in Tucson, or online at NativeSeeds/SEARCH and Flor de Mayo. Tepary Mix or Tom’s Mix will cook easily (after a few hours’ soaking, change water) either in a solar oven or crock-pot slow-cooker. The most efficient way to cook Tom’s Mix (after presoak and change water) is in a crock-pot. Put them on before you leave for the day and their inviting aroma meets you when you come in the door! When energy efficiency matters, cook your beans in a solar oven. Sunlight is a gift! 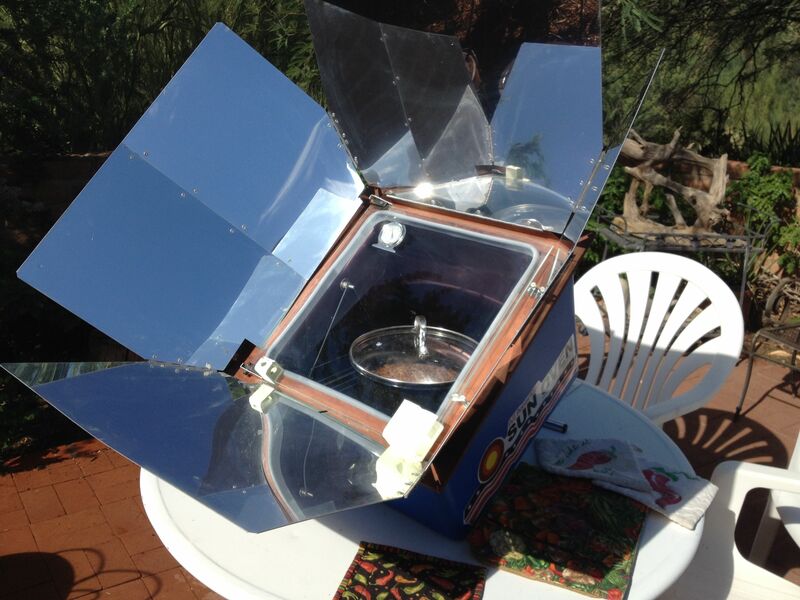 You can find a smoking deal on solar ovens at www.flordemayoarts.com. Here’s a recipe for the best bean dip you ever tasted–great to keep on hand in the fridge or freezer for when company pops in. As a bonus it is super healthy, gluten-free, high in protein, gives sustained energy, and helps to balance blood sugar! What more can one ask of a great fun-food? Wash, drain beans. (Presoaking beans 1-2 hours, drain liquid, speeds up the cooking but is optional). In a large pot put beans and drinking water. Bring to boil then simmer 2-3 hours or until tender. 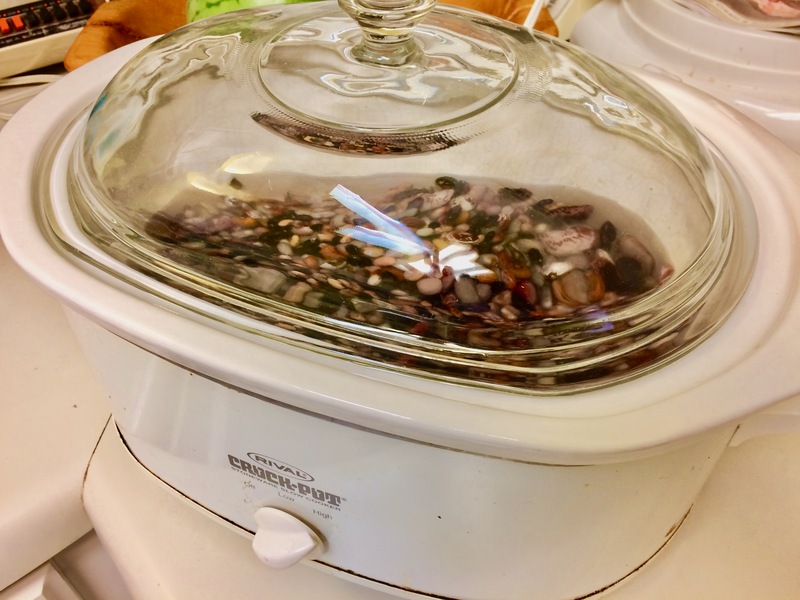 Alternatively, put soaked beans in drinking water to cook in slow-cooker 5-6 hours, or in solar oven, tending sun angle at 1/2 hour intervals, 3-4 hours. When beans taste done, drain into bowl reserving the bean liquid. With mixer or hand-mashing, puree the hot beans with other ingredients, adding about 2 cups reserved hot bean liquid until mixture is dip consistency. Put in microwavable dish for easy re-heating. Serve with corn chips for a complete protein complement, and enjoy the gifts of many Southwest farmers through ages of desert harvests. What a legacy! 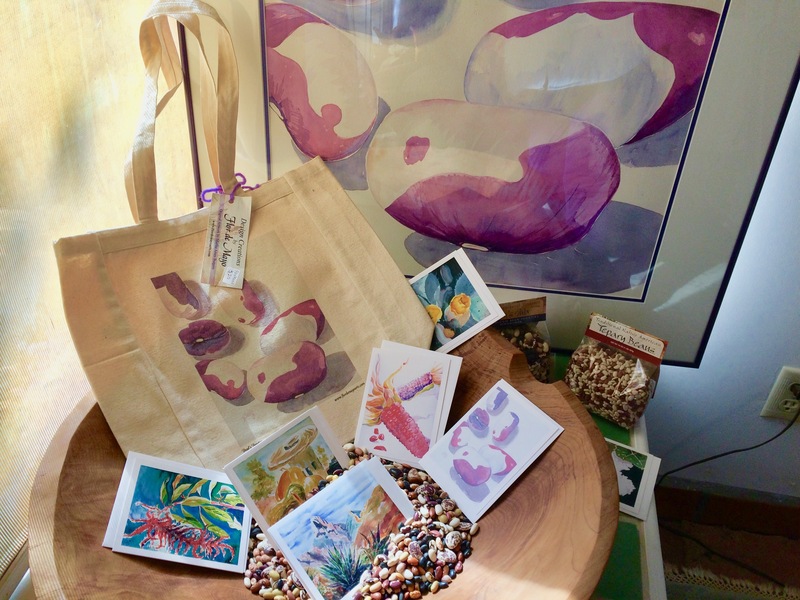 Southwest “bean gifts” from Flor de Mayo include not only these precious heirloom food flavors, but also feasts for the eyes, Native food watercolor notecards, canvas art totes, and original paintings by yours truly Tia Marta. Check links below….. I invite you to visit the specialty and other shops, parks, and museums in Tucson which carry our Flor de Mayo heirloom food mixes and other creations, totes, art notes, and jojoba soaps. At Sunday’s Rillito Farmers Market look for Tom’s Mix at Cindy Burson’s Country Harvest booth. You can also explore the Flor de Mayo website for perfect holiday gifts. We will soon be adding an online gallery of fine one of a kind watercolor paintings by Martha Burgess and the WildDesert nature photography of Roderick Mondt. 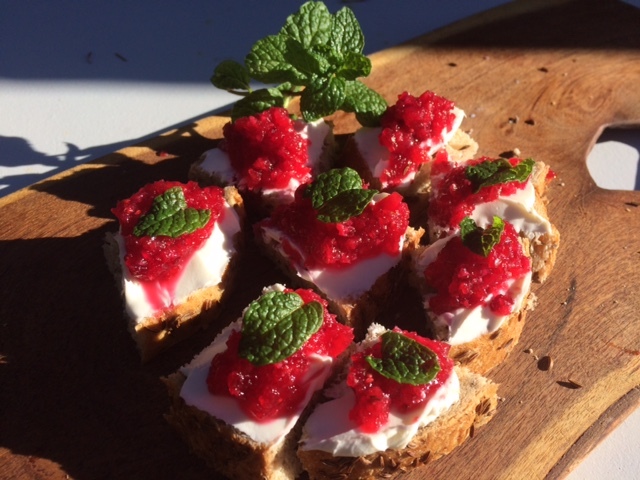 Happy holidays–eating well on joyous low-glycemic heirloom tastes from Tia Marta! It’s chile time in Baja Arizona! The local goodness of our Sonoran Desert foods can assert itself tastefully—yea, vehemently!—into other imported cuisines. Tia Marta here to share a wonderful new wrinkle to celebrate this holiday season, by wedding the local “vehemence” of our chiltepin pepper with an imported tradition. In decades since the 1940s, industrial ag and interstate grocery service have tried to make Baja Arizona into a food colony (but we are tastefully fighting back). Fossil fuels transport outside traditions to us that we do cherish and that help keep families together, like the many food traditions we celebrate at Tucson Meet Yourself in October each year. At the top of the import list for Yuletide is one borrowed from East-coast First Nations. (See Renewing America’s Food Traditions by Gary Paul Nabhan, UA Press, for more.) 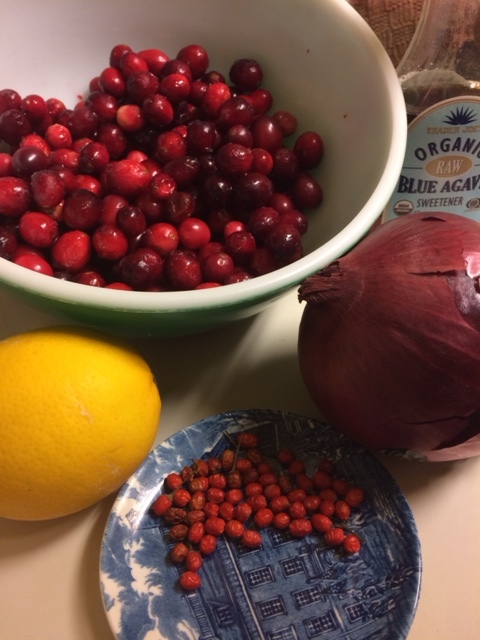 This imported gift from Native People of Southern New England and coastal New Jersey bogs that I’m referring to for holiday feasts is naturally the cranberry. Thank Goodness for trade routes! 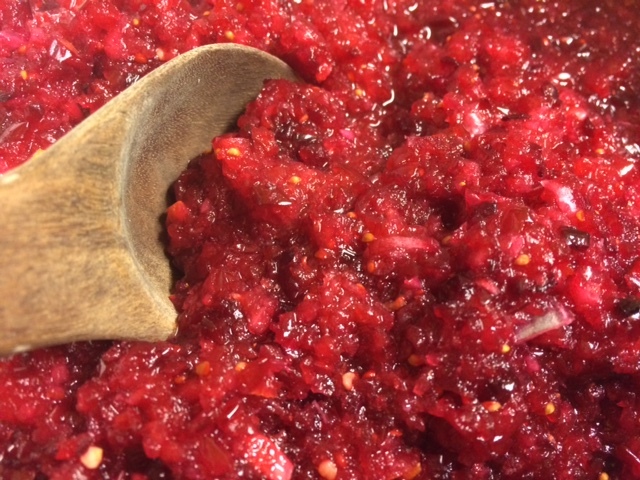 Local and import come together sensationally in my recipe for a raw, vegan Chiltepin-Craberry Relish. Dried chiltepines to use in the cranberry relish–They also make a great snack, great flavoring for Tom’s Mix SW Heirloom Beans, and super in any salsa. 8-12 dry chiltepin peppers for picante palettes, depending on “heat” desired (4-6 chiltepines for less picante). Start with less, then add more later if higher “vehemence” is needed. In a food processor, pulse all the fresh ingredients and juice at least 6 to 8 times, keeping the texture coarse. Chill in a covered bowl in refrigerator overnight or at least 8 hours, for time to meld the flavors. Stir the mixture; do a taste test. Add more honey or agave nectar, or chiltepines as needed for the sweet toote or picante palette. Spicy Chiltepin-Cranberry Relish can keep its freshness, flavor, and color in the frig for at least a week. Even the conservative palette will relish this holiday condiment—perfect for Christmas dinner or festive smorgasbords. Chiltepin adds a glorious kick to the sweet tart of cranberries, with a non-lingering wave of excitement to the tastebuds! You will find Chiltepin-Cranberry Relish as a fine complement not only to turkey or ham. Try it with bagels and cream cheese. Use it as a savory side, or with a salad, on any holiday platter. It’s a celebration of East meeting Southwest—Enjoy! We harvest chiltepines one by one as we need them, from our own chiltepin plants. Birds appreciate our chiltepin bushes as much as we do! Some of our plants I propagated from wild chiltepines in Arispe, Sonora, and Baboquivari. Some, purchased at Tohono Chul Park’s Chiles and Chocolate event, were propagated by experts Charles DiConcini and blog sister Linda McKittrick from Sierra Madrean plants. To buy healthy, productive plants for your own garden, be sure to put the NativeSeeds/SEARCH Valentine’s Plant Sale on your calendar for February. 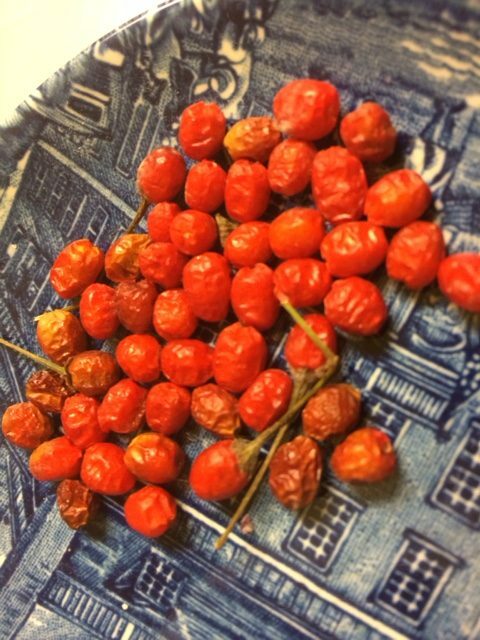 Fresh-picked mature chiltepin peppers–Caution: do not rub eyes after picking chiltepines! 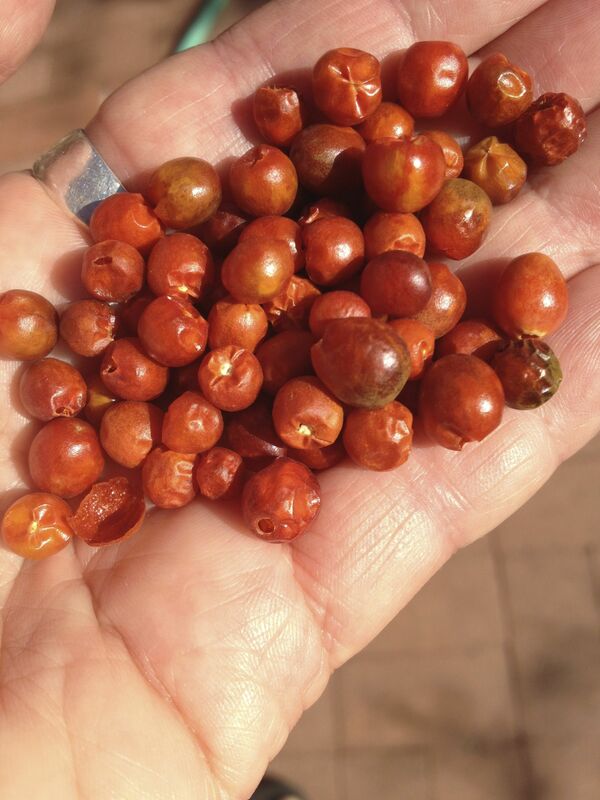 To source fresh dried chiltepin peppers for cooking and eating, visit the NativeSeeds/SEARCH store (3061 N Campbell Ave, Tucson or http://www.nativeseeds.org) or stop by Cindy’s Country Harvest booth at Rillito Farmers Market Sunday. 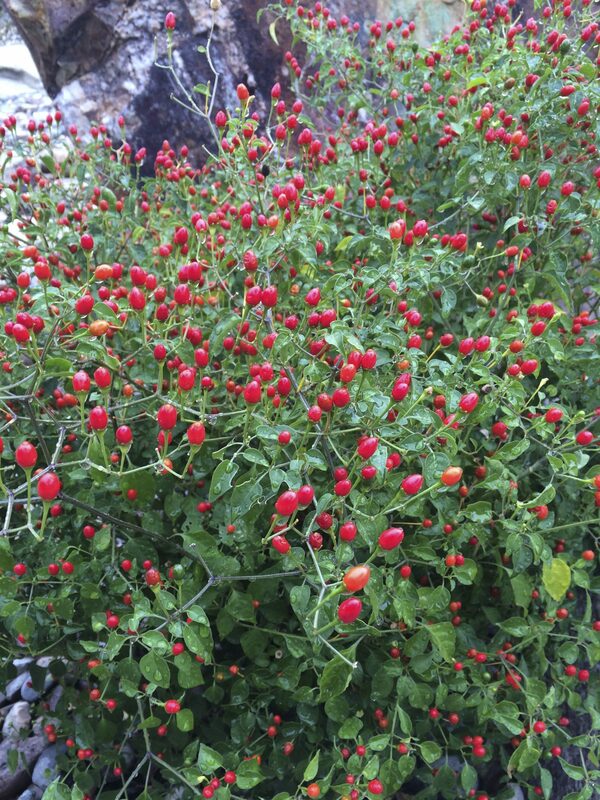 You can see live chiltepin plants in fruit at Tohono Chul Park and at Mission Garden in Tucson. 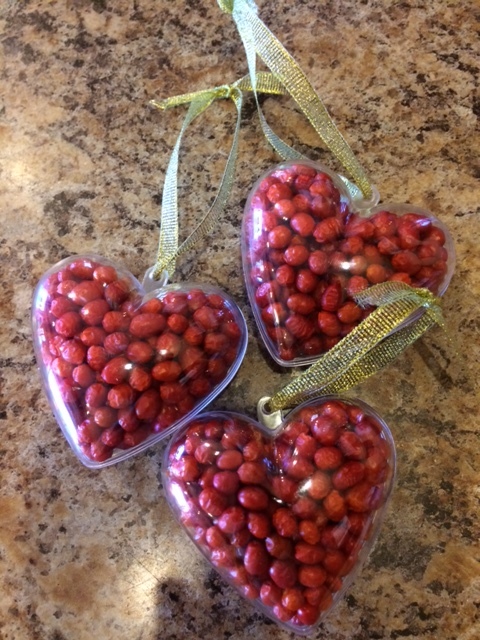 Chiltepin-filled Heart Ornaments are available at NativeSeeds/SEARCH Store for holiday decor and spice into the New Year! Another great idea: A couple of chiltepines added to Southwest Heirloom Bean Tom’s Mix makes it a perfect potluck crowd-pleaser. 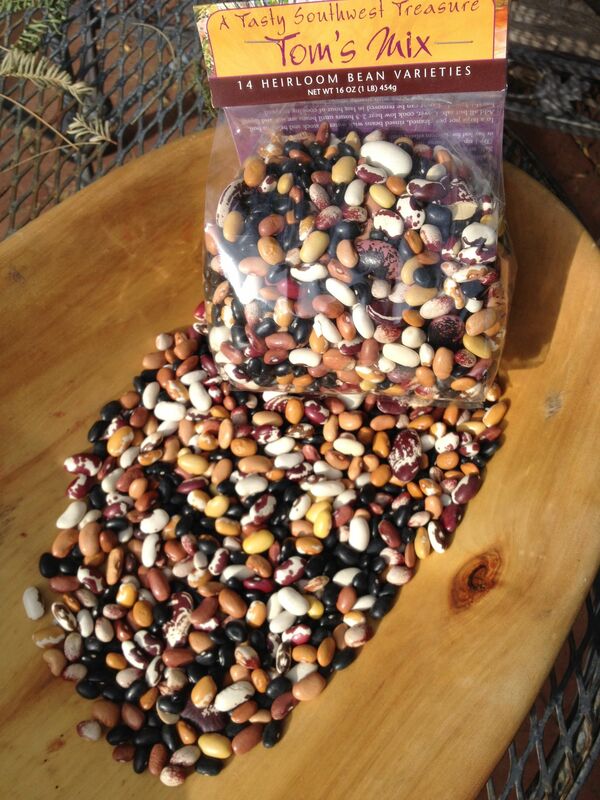 You can find SW Heirloom Bean Tom’s Mix at NativeSeeds/SEARCH, or for online gifts at http://www.flordemayoarts.com. Browse and Bedeck with Desert’s Bounty–Mustards and more! Love Chimichangas? Here’s a book for you. Javelina, foraging and hunting, Simran Sethi, Mexican ranch recipes, Michael Pollan, bio diversity, roosters "eaters"